Thanks for contacting us regarding ‘Breakfast’ broadcast on the 17 November. We understand you were unhappy with the interview with Oxfam’s Max Lawson as you felt that Max wasn’t challenged sufficiently. The BBC is committed to impartial and balanced coverage when it comes to this issue. There is broad scientific agreement on the issue of climate change and we reflect this accordingly;however, we do aim to ensure that we also offer time to the dissenting voices. Ironically, it seems that the power parliament has most interest in exercising nowadays is the manufacture of criminals, by making more and more conduct illegal, regardless of the effect on our essential rights guaranteed under common law. If government, any government, “believes it can do as it wishes without the constraint of a constitution which is enforceable then no-one and nothing is safe.” These are the views of a lawyer who has made a special study of the EU’s corpus juris proposals. Parliament cannot do as it wishes. There are a great many things parliament cannot do. 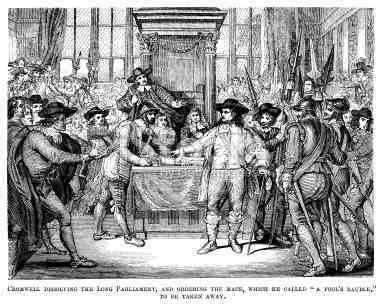 It cannot sit for more than five years, it cannot permit anyone not elected to speak in its chamber, nor anyone who has not sworn an oath of allegiance, it cannot dissolve itself and it cannot legitimately depose The Queen. 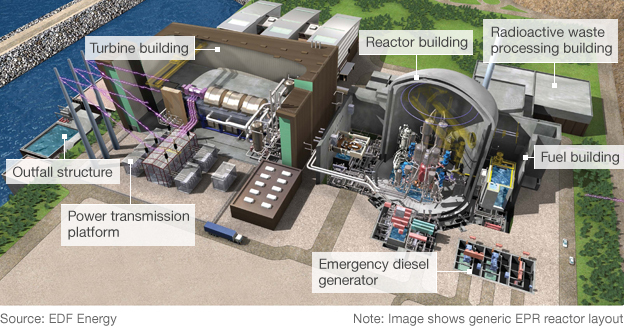 Hinkley Point — Deal or No Deal? Exactly half a century after the world’s first commercial nuclear plant began operation in 1956, British politicians decided to reverse the decline of the industry their predecessors had pioneered. Back in the ‘50s, it took just five years to plan, commission and build Calder Hall, which began producing energy in October 1956. But it has taken two governments seven years to draft energy bills, planning bills, design assessments, and much more besides to get to the point where we are now. French and Chinese state-owned companies will invest $16 billion on the new reactors at Hinkley Point. I’m delighted that at last we’re building new nuclear. But is the financial package a good deal for the energy consumer? Breaking news helicopter heavily crashing into Glasgow pub on a Friday night. I have heard sufficient to state this a police helicopter in fatal mechanical trouble, is embedded in the pub roof, with at least many injuries and probably fatalities. Thank goodness no fire. Less certain the rotor was not turning (press reporter eye witness). I want to conclude on climate change. It is neither wise nor accurate to attribute any specific weather event to climate change, but we do know that climate change is real. Due to the nature of what we are discussing today, I shall make this observation gently: there are worrying noises from parts of the Government regarding renewed scepticism about taking action on climate change. Will the Secretary of State put it on record that she is determined to take renewed action on climate change, which is one of the most pressing developmental and poverty reduction priorities for the Government, I am sure, and certainly for the Opposition? Talk about trying it on, trying not to seem to be saying. Pierre L. Gosselin at NoTricksZone has posted an article about the Austrian weather service admitting, well at least in effect, there is a problem with models, at least the computer climate kind. Staggering Concessions By Austria’s National Weather Service: “Natural Factors Substantial…Models Inadequate”! A November 11, 2013 press release by Austria’s national weather service, the Zentralanstalt für Meteorologie und Geodynamik (ZAMG), somehow got by me. And not surprisingly it was completely ignored by the German-language mainstream media. 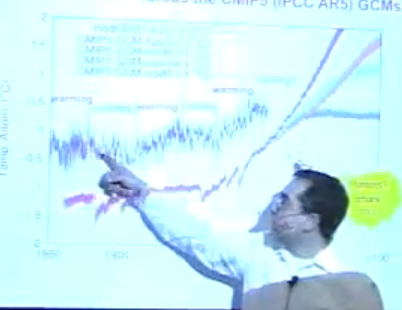 It’s titled: “Slower temperature increase: climate models under scrutiny“. I wonder what the major would make of all this fuss today? He was proud of his country, teach others how to handle snow. Water UK, which represents the water industry, and the UK Onshore Operators Group, the onshore oil and gas industry’s representative body, are to work together to help minimise the impact of onshore oil and gas development in the UK on the country’s water resources. Water UK and UKOOG today signed a Memorandum of Understanding (MoU) which ensures their respective members will cooperate throughout the shale gas exploration and extraction process. A key aim of the agreement is to give the public greater confidence and reassurance that everything will be done to minimise the effects on water resources and the environment. Water UK has reviewed recent reports into shale gas extraction, and believes that while there are potential risks to water and wastewater services, these can be mitigated given proper enforcement of the regulatory framework. The number of excess winter deaths rose 25% last winter to over 31,000, mostly pensioners. It’s long past time for Cameron to pull his thumb out of his arse wake up, smell the coffee and get to grips with the reality of the results of his government’s ‘Vote blue – Go Green – Turn Blue’ policies. 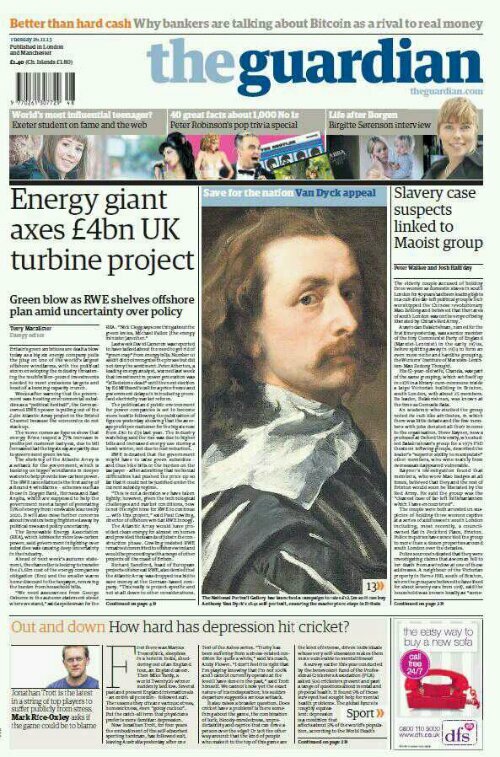 Ofgem has no power to regulate the prices charged by ‘the big six’ energy companies. Why not? 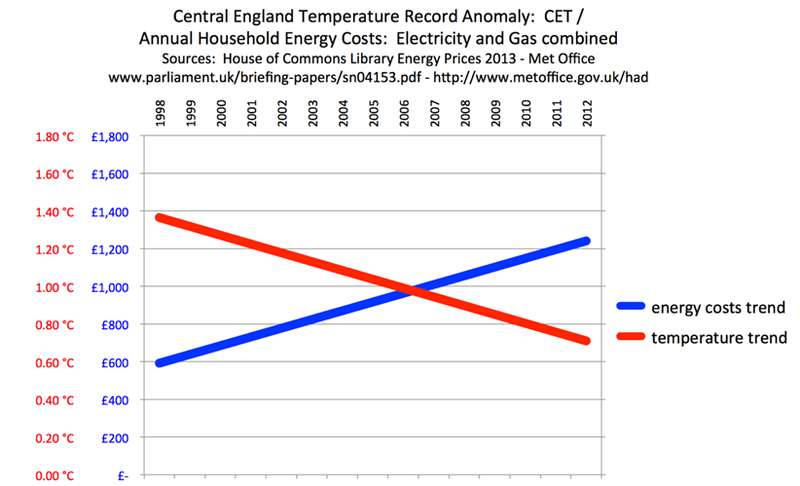 The profit they are making per household has doubled as temperatures have fallen and they have increased prices. In addition, ‘Green Taxes’ are now up to 10% of peoples fuel bill. ‘An exoplanet, or extrasolar planet, is a planet outside the Solar System’ – Wikipedia. At least 175 multiple planetary systems have been found as of 25 November 2013. Stuart Graham investigates. Exoplanets are a mixed bunch. Some are 10 times the size of Jupiter, others seem more like moons and may orbit their star in less than 2 days. Here we’ll look first at a small planetary body in the solar system, see how it relates to its neighbours, and then see what similarities and/or differences can be found in a few selected exoplanet systems. There may even be a few surprises. Less well-known than Pluto is its supposed twin Orcus, or 90482 Orcus to give its full name. It’s a trans-Neptunian object or maybe a dwarf planet. As it even has its own moon Vanth, it has the reputation of being the ‘anti-Pluto’. Its orbit looks like a mirror image of Pluto’s orbit (red: Pluto, blue: Orcus, grey: Neptune). Plans for an off-shore wind farm double the size of any currently operating in Britain have been rejected by councillors in north Devon. About 25 protesters against the Atlantic Array plan attended the North Devon Planning Committee meeting. After two hours of speeches and debate, councillors voted 10 to three to reject the scheme on six grounds. A final decision will be made by the Secretary of State next year. 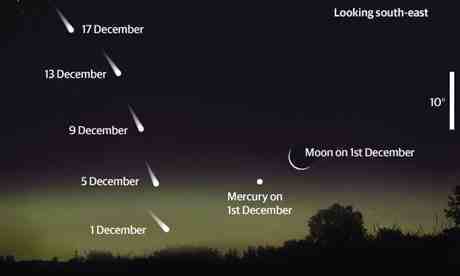 Comet Ison: Could a break up pose a threat to Earth? The intense sunlight will heat the comet to about 2,700C, speeding up its evaporation. In the past some comets have been seen to vaporise under such an onslaught. 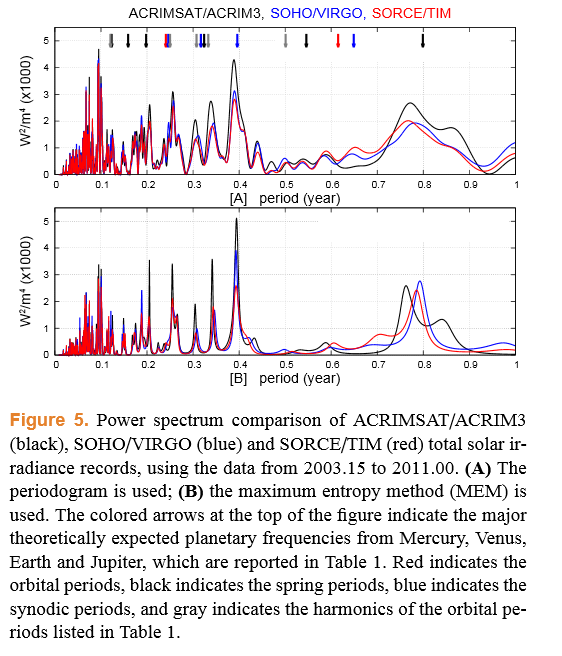 Multiscale comparative spectral analysis of satellite total solar irradiance measurements from 2003 to 2013 reveals a planetary modulation of solar activity and its nonlinear dependence on the 11 yr solar cycle. After departing the Warsaw climate summit, I visited Oslo at the invitation of Klimarealistene. This climate skeptic group has translated my IPCC exposé, The Delinquent Teenager, into Norwegian and published it in paperback there. 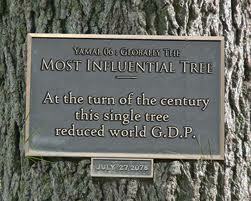 Klimarealistene hosted, organized, and publicized an event in which I was the guest speaker. In the neighbourhood of 100 people attended – including a politician or two, a couple of journalists, and an individual linked to that country’s Academy of Sciences. This is an extremely active skeptic group. One of the secrets to their success appears to be the fact that they sell annual memberships. This provides them with a modest budget that permits them to organize events such as mine. Hat tip to Geoff Chambers and Tom Nelson for alerting us to this gem hidden away on archive.org. A the beginnings of plot for a film about the Climategate emailS plus background research by Michael Kelly. It’s very long, and I’m reblogging it here so it doesn’t get lost. Dip in and enjoy. Like an Aristophanes satire, like Hamlet, it opens with two slaves, spear-carriers, little people. Footsoldiers of history, two researchers in a corrupt and impoverished mid-90s Russia schlep through the tundra to take core samples from trees at the behest of the bigger fish in far-off East Anglia. Stepan and Rashit don’t even have their own e-mail address and like characters in some absurdist comedy must pass jointly under the name of Tatiana M. Dedkova. Conscientious and obliging, they strike a human note all through this drama. Their talk is of mundane material concerns, the smallness of funds, the expense of helicopters, the scramble for grants. They are the ones who get their hands dirty, and their vicissitudes periodically revived my interest during the slower stretches of the tale, those otherwise devoted to abstruse details of committee work and other longueurs. ‘We also collected many wood samples from living and dead larches of various ages. But we were bited by many thousands of mosquitos especially small ones.’ They are perhaps the only likeable characters on the establishment side, apart from the exasperated and appalled IT man Harry in the separate ‘Harry_read_me’ document, and I cheered up whenever they appeared. ‘Slaves’ is horseshit, and ‘footsoldiers’ insulting, but if scientists are allowed to put a creative spin on facts, I can certainly do so. They are respected scientists: in fact, it emerges, eminent or destined to be eminent. But they talk funny and are at the beck and call of CRU, are financially dependent on them; when the film is made they will be comedy relief, played by Alexei Sayle and the dopey one out of The Fast Show. This is great stuff, with Nicola launching straight into the heart of the matter from minute number 1. He says right at the beginning that the oscillations in the solar system caused by planetary motion are mirrored by climate changes on Earth. Someting we have discussed a lot here over the last four years. Image 7 of a sequence showing on faz.net, a German political newspaper. Today Germany’s flagship political daily, the renowned Frankfurter Allgemeine Zeitung (FAZ), which has long been a disciple of global warming religion (woeful deficits in climate sciences have long been a problem of the German mainstream media) raised a few eyebrows in daring to feature the global warming-blasphemous chart that no German was ever supposed to see. Wyoming wind-farm operator Duke Energy Renewables pleaded guilty in the first federal case of its kind, admitting its turbines at two sites have killed 14 golden eagles and 149 other birds since 2009.
h/t to Roger Andrews on Suggestions. Germany is seeking to force Britain and other European countries to commit themselves to building many more wind and solar farms under a new European Union target for reducing greenhouse gas emissions. Berlin is demanding that the 2030 emissions target, which the EU is negotiating as its contribution to a global deal on emissions, should include a minimum level of renewable energy. Barnstable Superior CourtJudge Muse issued an order requiring the Town to return immediately to the 7 hours ON, 7 hours OFF operation of the town’s wind turbines. 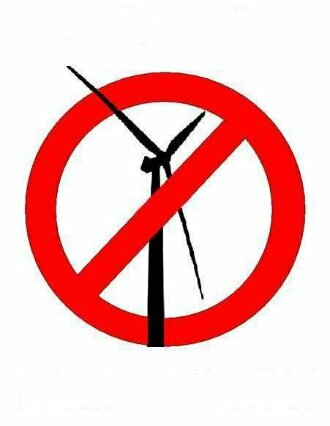 The Court further stipulated that on Sundays, Thanksgiving, Christmas and New Year’s, the turbines will be shut down. I was unaware of this until today when someone pointed to a photograph in a newspaper.